Well, it is not truly leaked but it is appeared on the Internet. To me it looks wonderful. I am really impressed with Jens Hoffman's work! TYPO3 wins a lot from talented people like Jens! The only thing that bothers me is fading on the home page. There is no need for it at all. People often complain that RealURL is hard to configure. In my opinion it happens because RealURL manual is written as a reference guide, not like a tutorial. Therefore there is nothing for beginner to start from. Recent RealURL versions include automatic configuration, which is good for simple web sites. However it is not flexible enough. Manual configuration would always win over automatic one. This article provides a simple guide for manual RealURL configuration. It is not short, so reserve some time for reading it. The whole guide is divided to several parts. The first part describes configuration in general. Other parts will describe details, tips&tricks and best practices. This section covers general principles of RealURL functionality. Before we start with configuration, it must be clear what parts RealURLed URLs can contain. Increasing performance of a TYPO3 web site is a task that many large companies or freelancers face from time to time. TYPO3 is a great, flexible and powerful framework with amazing possibilities and unlimited expendability. But everything has its costs. TYPO3 may be slow if not configured properly. This article gives 8 tips to improve TYPO3 performance. It requires that you have administrator (root) access to the web server. If you use shared hosting, there is very little that you can do. Read on. 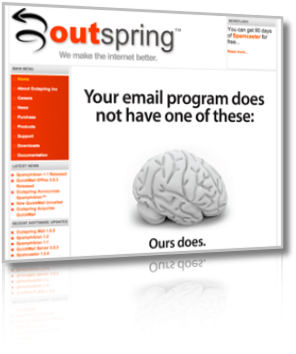 Do e-mail programs have brains? For a long time I am looking for a good mail program for Mac. While doing the same search this evening I found a very nice looking web site. It says that their e-mailprogram has brain. Others don't. Is that true? We will know soon. I am going to download and try it. I am going to replace Thunderbird with something for Mac-like (no, not Apple Mail, it does not support IMAP subscriptions, sorry) and this is one of candidates. Recently a problem was discovered with several web sites. I must say that the problem is not TYPO3-specific but will happen to any web site that uses <base> tag. We will solve it for TYPO3, of course. The problem happens as follows. Some user agents seems to ignore the <base> tag and requests invalid URLs. For example, while viewing the page at domain.tld/hello/world/ such agents may seea reference to the image at typo3temp/pics/12345.gif . If user agents ignores <base> tag, it will request domain.tld/hello/world/typo3temp/pics/12345.gif. The result for such requests is obvious: page not found and 404 error. Now look closely to the URL. It is a TYPO3 URL. It means that TYPO3's 404 handler willbe invoked. Now if that page contains link to typo3temp/pics/12345.gif the process will become recursive. This will cause huge amount of useless traffic for the web site. The problem is pretty serious and important for many web sites already. How to solve it? Here is a small tip that can be useful for developers. Now you can use ptry -p0 < patchfile to try the patch before you apply it. Simple, isn't it? Why didn't I add -p0 to the alias? Because not all patches are made over the right directory. So you may want to specify this option manually. There is a reason why I do not buy online a book even if it looks good for me. The reason is: there is no sample chapter. People like samples. Everyone tried garlic at least once in his life and made his/her personal opinion about it. This was a sample. Everyone tried coffee or chocolate. These were samples too. They either stayed as samples (if person did not like it and never tied it again) or become an enjoyed product. Sample chapter tells user if the book is really what I'd like to buy, read and have in my library. This is especially important if book costs over 20€. Would this book be a good investment? Title sounds attractive but I do not want to loose money just to find that title is the only good thing. Of course, people can read opinions of other readers of the book. But this is not a replacement for sample chapter. It is the same as above examples with garlic or coffee: everyone has its own taste. Fortunately many books have sample chapters on the Internet. Recently I prefer to buy only books that I could sample. It helps to build a good library and save money. So, if you are writing a book, put a sample chapter somewhere. It will help to increase your sales. Recently I often see that TYPO3 plugins do not create links properly. It seems that authors simply do not know how to make links properly in TYPO3. As a result links are not RealURL-compatible or cache issues happen. This article shows how to use typoLink in Frontend plugin. Amazon has a nice service called Amazon Prime. For $80 annual payment people can get faster deliveries and even free deliveries next day. So far, so good. But look to the attached picture at the bottom of this post. There are two color marking there. The red one says I qualify for Amazon Prime. Sorry to disappoint you, Amazon, but I am not!I live outside UK, so I do not qualify for Amazon Prime. Don't tell me they do not know who I am. I just logged in to check status of my orders. The green marking at top says that this item can be delivered in one day with Amazon Prime. But look to the bottom green marking. How are they going to deliver it within one day of it ships in 1-3 weeks? I ordered this item together with other items two weeks ago. Other items were sent, this one is still not sent. I am not sure about UK but in my country this is called "false advertisement" and prosecuted severily. Yet another thing. I decided to see what will happen if I sign up for a "free trial" at Amazon Prime. Guess what? Clicking on the "Free trial" asks to confirm payment through credit card. I wonder why. Since when "free" requires payment? Amazon is usually great but these small things do not add good points to Amazon. I already think I should search for another source of books. Slow and high-priced shipping + offers that lead to "sorry you are no elligable..." do not make me happy customer. Are you a good driver? If you answer yes, think if you can easily drive the cross shown on the attached image. It is located in Swindon, England and called Magic Roundabout. It has one large roundaboud and each entry is a smaller roundabout (total five of them). I would not bet that I can pass it easily. Especially with right-side driving. If you look into the description and photos of this place in Wikipedia, you will notice that large roundabout has two ways of circling in it: inner circles moves in the opposite (to typical England) direction, outer moves in the right direction. I also read that only those who live in this area can quickly pass the place in the optimal way. Not sure if it is true or not. For those, who liked the place: you can order a T-shirt with magic roundabout schema. Did you know that you can make your Mac working like a musical clip machine? No? Watch the video below. Just watch it! Full day of good mood guarantied! Andreas Becker has a nice summary of how to configure CoolURI comparing to RealURL. Very nice and useful page for those who migrate from one extension to another and for newbies. I forgot! Different hooks in tt_news! Unlike computers, people do not have memory that fixes everything and keeps it fixed. People may forget all or some information. Today I forgot that tt_news has two different hooks for extra markers: one for news items (called in a loop, named extraItemMarkerProcessor) and another is for the compiled output (called just before final substitution of all markers, named extraGlobalMarkerHook). Why am I writing it here? Because people can forget. By mentioning it here, I create additional bounding in my own memory and memory of my readers. So, less chances to forget.